Up until now, you would be forgiven for thinking that I only sew for one person, but in reality, I’m quite a selfish seamstress. I really want to be sewing things for myself. 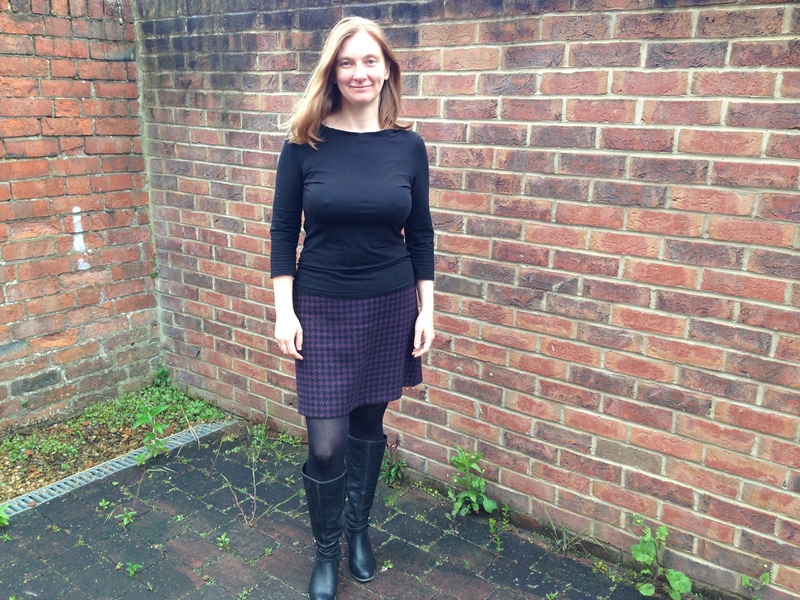 The first project I have sewn for myself in a long time is the Great British Sewing Bee A-Line Tweed Skirt. Given my desire to make sure that every project challenged me, what was the novelty about this one? 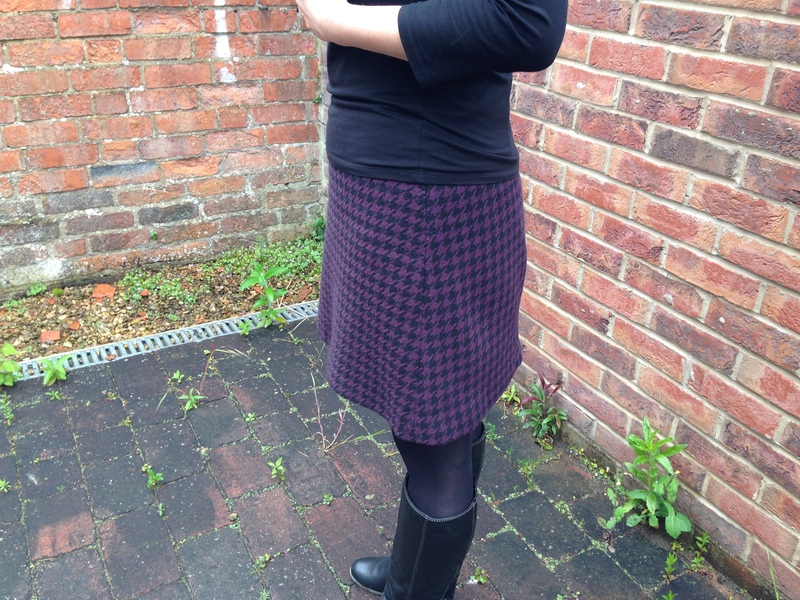 Well, there were a few things that I thought were novel (and I was right) I have never made a lined skirt before, so that’s a definite novelty, and I’ve also never sewn woollen fabric before, so that’s also a novelty. but decided that it looked like rather a loose weave, and so decided to give this purple dogtooth wool (also from sewoverit) a try for my first attempt with wool. Having always sewn with cottons / very stable, non-shrinking material, I was very gentle with the wool. I steamed it with the iron, I checked how much it shrunk, and then I shrank the lot with the steam iron, being careful to ensure that it was cool before I let it drape over the edge of the ironing board to prevent it taking on shapes that I didn’t want. All as per instructions in the GBSB book / other websites / talking to my patient mother and utilising her many years’ experience! I then drafted the pattern as described by the instructions in the book and, making sure that I took note of the right and wrong side of the material I cut the three pattern pieces out of the main fabric. I cut the back pieces one at a time, to try and match the pattern down the centre back seam, and also because I wanted to make sure that the two layers of material didn’t walk over one another, resulting in an oddly shaped pattern piece. Well, my pattern matching was perfect, apart from one slight thing – in my care to get everything correct, I had forgotten to ensure that the material was going in the same direction on the pieces, and so my back pieces didn’t match my front (the dogstooth was upsidedown). 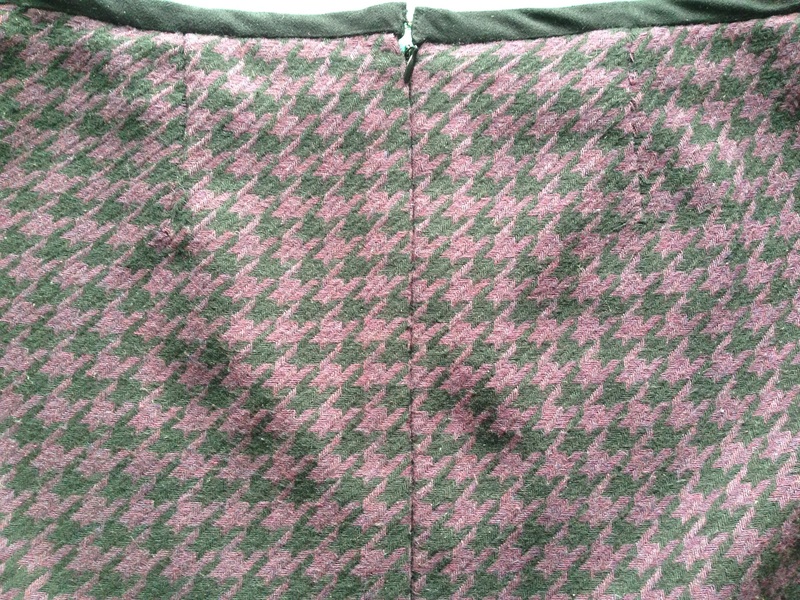 If you look closely at the picture, you can see that the purple teeth go one way on the skirt (on the right of the picture) and the other way on the spare piece (on the left). 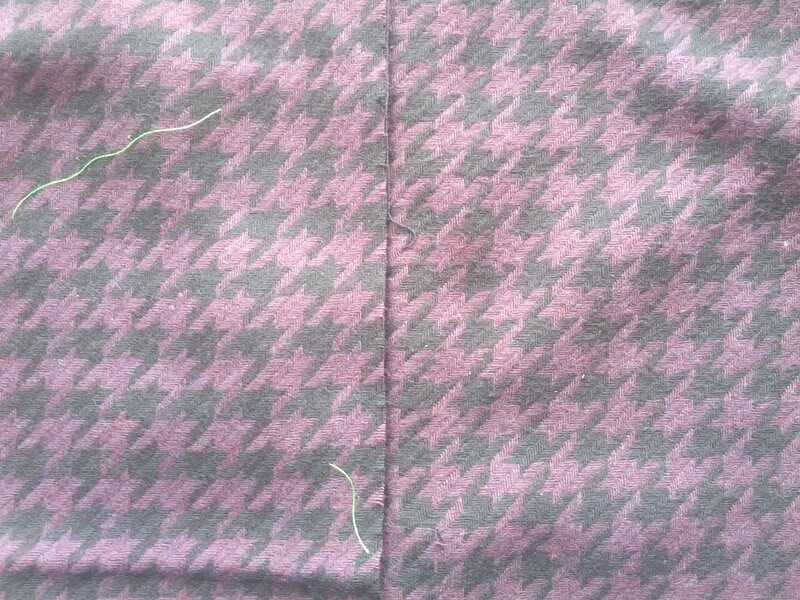 Pattern Matching, with Upsidedown Dogstooth! I then went back, rematched the pattern pieces, (making sure that the material was the right way up), and that the horizontal stripes continued around the skirt). It took me a while to work out how to do this, but eventually I realised that what I wanted was for both the front and back notches on the side seam to be aligned – I think I had all the side-seam notches lined up with the centre of a purple horizontal stripe. Success! 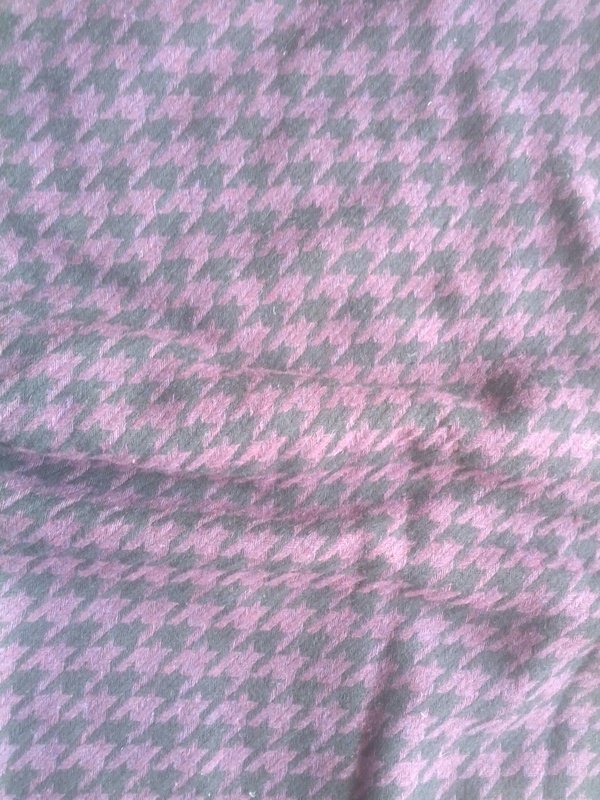 and I now have the back half of the next skirt cut out (now I just need to find someone that’s the same size as me, and who might want a purple dogstooth A-line skirt!) 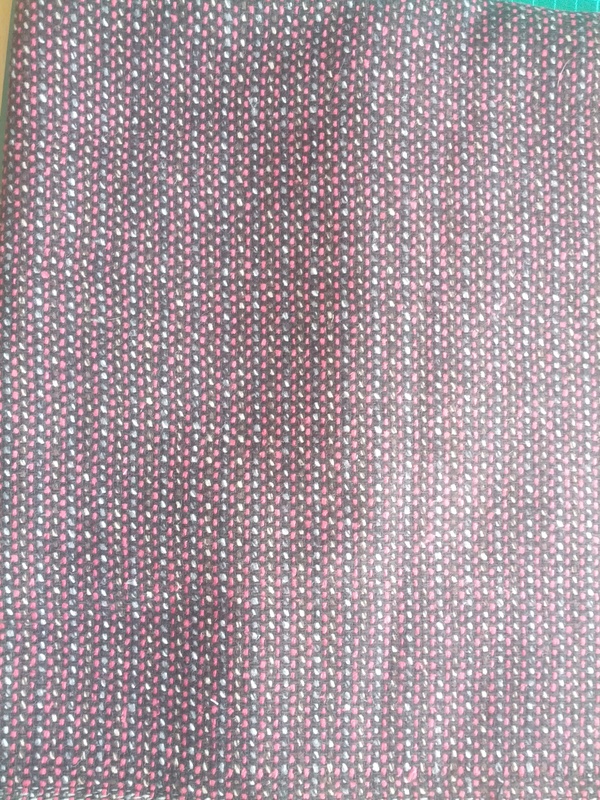 On that note though, I was pleased to realise that as this material is wider than that mentioned in the pattern, the whole skirt came out of half a metre – or at least, that’s how much it should have taken; as I say, I now have the best part of half a metre, and also a couple of pattern pieces spare!